They only eat vegetable and vegetable materials and need high fiber diets to maintain good digestion. Providing high-quality grass hay pellets and fresh hay, along with vegetables and fruits provides good nutrition. They must have clean water that is freshened regularly. 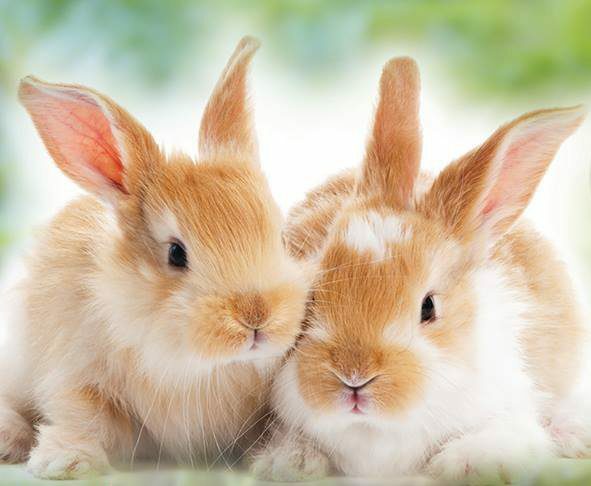 Rabbits’ basic nutrient needs are protein, carbohydrate, fat, vitamins, minerals, and water. The optimum protein intake is 12% to 18%. For times of gestation and lactation an 18% protein intake is recommended and growth requires 15% to 16%; maintenance requires a minimum 13% dry matter protein. According to Vetsecure.com, “a diet too high in grain or fermentable fiber, such as oats and corn, can cause enteritis. Enteritis is a gastrointestinal disease that is basically inflammation of the intestines. High levels of non-digestible fiber, such as timothy grass hay and alfalfa hay, may help prevent enteritis and obesity. Non-digestible fiber is not fermented in the cecum, whereas digestible fiber is fermented by passing though the cecum. Additionally, Non-digestible fiber like Timothy and Alfalfa hay is important for dental health because it helps wear rabbits’ teeth, stimulates gut motility, helps rabbits digest cecotrophs as well as prevents colonization of the cecum by pathogenic bacteria, helping to prevent bacterial overgrowth and decreasing the likelihood of enteritis. Rabbits do not need fat added to their feed. Mountain Sunrise – Timothy Hay Pellet: This all-natural hay pellet is made from 100% pure sun-cured timothy. This highly digestible pellet can be used to completely replace loose hay or supplement pasture for horses, cattle, sheep, goats, rabbits, etc. Our hay is cut, dried, chopped & pressed. Our pellets are very palatable, and no molasses is utilized in this product. Our quarter inch die allows us to form a firm pellet without the use of bentonite or other additives/binders. This product is made without dust, waste, or additives. They are easy to store with no waster. Sold in 50lb bags or bulk. Mountain Sunrise- Alfalfa Hay Pellets: This all-natural hay pellet is made from 100% pure sun-cured alfalfa hay. This highly digestible pellet can be used to completely replace loose hay or supplement pasture for horses, cattle, sheep, goats, rabbits, etc. Our hay is cut, dried, chopped & pressed. Our pellets are very palatable, and no molasses is utilized in this product. Our quarter inch die allows us to form a firm pellet without the use of bentonite or other additives/binders. This product is made without dust, waste, or additives. They are easy to store with no waster. Sold in 50lb bags or bulk. Modesto Mills Organic Rabbit Feed: These pellets are formulated for growth of rabbits and chinchillas. Certified organic ingredients used in our rabbit and chinchilla formulas are not formulated with corn, soybean meal or canola meal. We use organic yucca, which cuts down on ammonia in the cage. Excess ammonia has been linked to respiratory issues. All of our products take advantage of the powerful properties of garlic, anise oil, horseradish, and juniper berry oil. Natural-sourced vitamin E (d-alpha tocopherol) is retained better and for a longer time in the body, making it more bioavailable when compared to synthetic vitamin E. Also added is Extracted Citric Acid Presscake that helps animals in their defense against health challenges. Pichia guilliermondii yeast adheres to pathogens and creates immune activity. Certified USDA Organic and Non-GMO. Sold in 10lb, 25lb or 50lb bags or bulk. Redmond Loose Salt: This 50lb bag of loose salt is suitable for all livestock particularly feedlot or pasture livestock. Please note that Redmond uses organic iodine (EDDI) in this product which has been thought to help with foot rot and pink eye. The salt deposit that exists in Redmond, Utah, is an inland deposit of ancient origin. It is one of the world’s richest and most perfectly balanced salt deposits, containing over 60 trace minerals from the periodic table of elements. It is mined and crushed for packaging, without any of the refining processes. So what’s left for us is pure, unaltered sea salt and minerals that are balanced in a proportion–nature’s way. In this balance of minerals, the salts in the Redmond deposit consist of around 93% sodium and chloride; the remaining 7% are the other minerals. It is of no coincidence that our blood serum has the same concentrations! That is significant! Is it any wonder people feel better when they use natural sea salt? Is it any wonder that animals and plants are healthier when they utilize natural minerals? The mineral salt that comes from the Redmond mine is in the form nature intended for ingestion. The body does not easily recognize refined products, causing it stress as it tries to work with something unnatural. It is important to note that these natural salts are crystalline in form. They are highly available to the body. Most minerals are in rock form and are poorly utilized. The chelation process improves this but the crystalline form trumps. Sold in 50lb bags and in bulk. LuvNest Layer Herbal Blend: Layer Blend is specifically targeted to help sooth animals. Beautiful Red Raspberry, Red Clover, and Nettle are natural helpers, and we added Lemon Balm and Chamomile to help calm and de-stress.